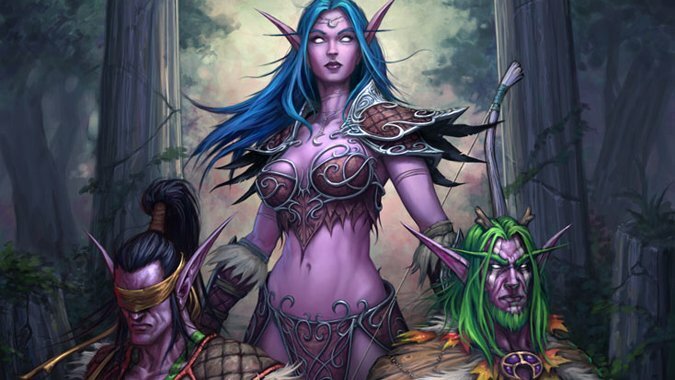 All Elves on Azeroth today date back to the ancient Kaldorei who rose to power before the Sundering. These Elves have fragmented over time, each choosing a different path. Yet all are Elves, descendants of those same beings who found the Well of Eternity in the darkness of ancient Kalimdor and who mastered its power as none had before them, or have since. What remains today of these ancient people? Even amongst the races we term “Elves” today, there’s a lot of variety. Modern Night Elves (the Kaldorei, or ‘Children of the Stars’) are the descendants of those who took the pact with the Dragon Aspects, becoming nigh immortal in exchange for holding an eternal vigil over Nordrassil — the World Tree, and the Well of Eternity beneath its roots. Even now that the pact has been ended with the near-destruction of Nordrassil and the death of Archimonde (however permanent that turns out to be), these Elves continue to embrace Druidic and Priestly magic while eschewing the arcane. A subset, the Shen’dralar Highborne, have recently returned from a ten thousand year exile to teach arcane magic to those few Night Elves willing to learn it. High Elves (Quel’dorei, which means ‘Children of Noble Birth’ in Darnassian and simply ‘High Elves’ in Thalassian) are the few remaining descendants of the ancient Highborne. They once ruled Queen Azshara’s empire that were not corrupted into Satyrs or Naga, or isolated and lost like the Shen’dralar Highborne or Nightborne. The High Elves were exiled from Kalimdor over 10,o00 years ago, after using their arcane power to create terrible storms in an attempt to convince the Kaldorei of that time that their magic was necessary. Traveling to the Eastern Kingdoms, they attempted to settle in what is now the Tirisfal Glades before arriving in modern Quel’Thalas. While some still remain, they are the merest remnant of a remnant, essentially exiled for a second time and forced to seek shelter in a few isolated locations. Blood Elves (Sin’dorei, or ‘Children of the Blood’ in Thalassian) are the bulk of the survivors of the High Elves. They were forever changed by the rampage of Arthas’ Scourge army, and his assault on Quel’Thalas as part of his master’s plan to use the Sunwell to reanimate Kel’Thuzad as a mighty Lich. Nine out of every 10 High Elves were slain in the process, and the survivors were renamed Blood Elves to honor their sacrifice, as well as personify their drive to continue their people whatever the cost. Today Blood Elves are a part of the Horde, using their hereditary gift with the arcane to earn their place. Recently we’ve discovered that the ancient Highborne were not all destroyed, converted, or exiled. 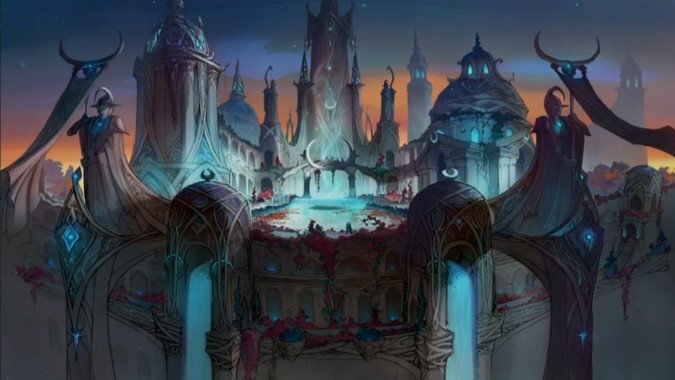 The city of Suramar endured even after the destruction of the Well of Eternity, and in this long-lost city — home not only to the Stormrage brothers and Tyrande Whisperwind, but also the Shadowsong clan — a cadre of former Highborne endured for ten thousand years, becoming the magically gifted and indolently corrupt Nightborne. We know that they are ruled by a Grand Magistrix, but as of yet that’s all we know — we don’t know how they survived the Sundering, or if the story of Guardian Aegwynn raising the old Temple of Elune in Suramar to become the Temple of Sargeras happened in a portion of the city lost during the destruction of the Well of Eternity. But not even the Nightborne are the last people connected to the ancient Kaldorei empire. In addition to the various races of Elves, several creatures no longer even remotely Elven can claim descent from the Kaldorei of old. The Satyr are descended from Xavius, the Nightmare Lord and first of his kind on Azeroth. Changed by Sargeras, Xavius was given the power to transform any of his people who wished it into monstrosities like himself, and many among the Highborne accepted, seeking greater power. First seen on Azeroth during the first invasion of the Burning Legion, these monstrosities have continued to plague their former people ever since, managing to even infiltrate Ashenvale, Felwood, and even Darnassus itself. 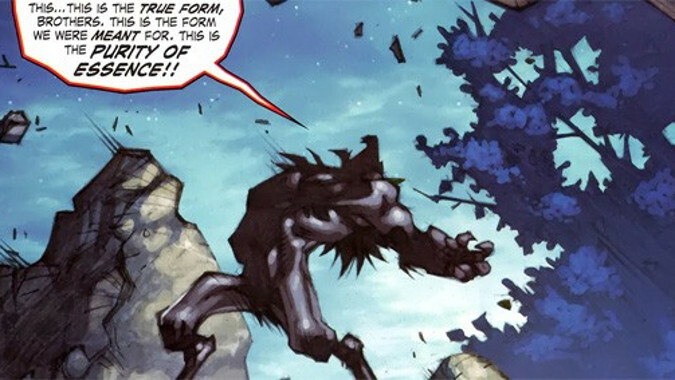 The most conspicuous moment in Satyr history was the War of the Satyr, where these vile creations of the Legion united their people in a war against their former kin and were utterly defeated, a defeat so total that to this day the Satyr lack anything resembling a central leader. They endure in separate clans on the fringes of Night Elf territory. Amazingly, it’s possible for a Satyr to be redeemed and returned to the form of a Night Elf, although the one time this happened was via the intercession of Elune. The Naga are the aquatic serpentine race ruled by Queen Azshara, former monarch of the Kaldorei and the one who nearly destroyed the entire world by bringing the Legion through. Following the destruction of the palace at Zin-Ashari when Malfurion destroyed the Well of Eternity, Azshara and her closest Highborne servants were given an offer by the Old Gods — an offer that transformed them forever into the monsters that now haunt Azeroth’s oceans. The Naga were recalled to the surface of Azeroth by Illidan Stormrage during his quest for Suramar and the Eye of Sargeras, which was left by Aegwynn in the Tomb she raised for the Avatar of Sargeras’ remains. Since then, they’ve proved a malevolent threat to both Azeroth and Outland. Their Queen has been a power to be feared, enslaving Neptulon and helping divide the forces defending Hyjal at a critical moment. We’ve yet to see Azshara’s full power — perhaps she has a greater role to play in Legion. The Worgen of Gilneas are former Humans, but the curse that transforms them into savage creatures of feral bloodlust is born from Night Elves — specifically, a sect of Druids called the Druids of the Claw, who developed the Worgen curse by tapping the power of Goldrinn, the Wolf Ancient, during the War of the Satyr. Ralaar Fangfire and Belysra Starbreeze created the Scythe of Elune and used it to hone the forbidden Pack Form, despite Malfurion Stormrage’s edict forbidding it, due to their anger over the death of Arvell — Ralaar’s best friend and Belysra’s mate — during the war. Believing that Arvell would have lived had he taken the Pack Form, they sought a means to perfect it, and in so doing created the curse of the Worgen, a hybrid form that could spread the fury of Goldrinn via infectious bites. All modern Worgen are those who have been cursed in turn, in part due to the machinations of Alpha Prime, the former Ralaar Fangfire. As we can see, the Elves of Azeroth have had a great influence on their world, changing it many times. 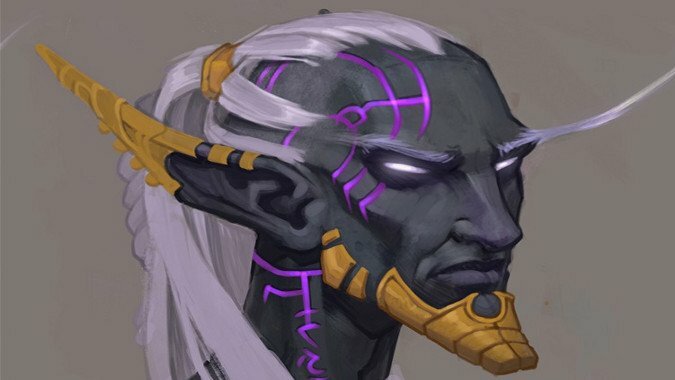 With Legion, the legacy of the time when all Elves were Kaldorei comes around at last, and after ten thousand years we’ll see if there is any hope of peaceful coexistence for them. I would not depend on it happening.